Hi there! Today is Sew, Mama, Sew's Giveaway Day. Thanks for stopping by! If you're here for the first time, welcome! I hope you'll stick around. 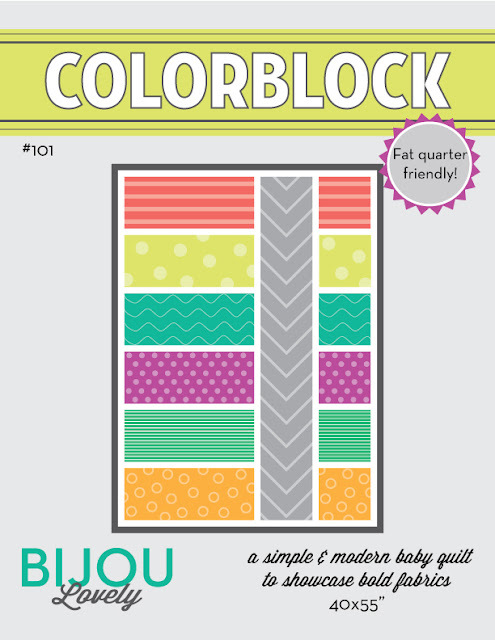 I'm going to offer up 5 copies of my Colorblock Quilt Pattern to 5 lucky winners today. The pattern will come as a PDF, so this giveaway is open to everyone! To enter, simply leave a comment on this post. Tell me what you did this weekend, your favorite new color combo, what you've been sewing recently, anything! Followers get an extra entry by leaving an additional comment. Please leave a way for me to contact you in your post if it is not linked in your profile. This giveaway will close on Friday, May 25 at 5pm PST. Update: This giveaway is now closed! Congrats to our winners, #318 Kelly Smith, #218 emmy, #238 Sarah, #162 Kirstin@SquintMom, and #336 Charlene. I'm excited I have a chance to win this pattern. It's been on my "want to buy" list! As if I need another project on my "to do" list... but I would love to make this quilt! I've been inspired to make quilts for Quilts for Kids. I'm a pretty novice quilt maker, but I'm loving it. I just got my Quilts for Kids packet in the mail and am working on that. I'd love to make the colorblock quilt! This weekend I made a few pincushions and a thread catcher and got the quilting done on my second quilt! I am working on a Tree of Knowledge Library Book Bag tutorial. I have been eyeing this pattern for weeks! I love that it is FQTR friendly! Thank for the chance to win! I am currently sewing a chevron quilt in Reunion by Sweetwater. I want to hurry and get it finished because I want to use it as a picnic blanket for the outdoor concerts in our city that start in June!!! I wish I could leave work and sew :)I love your blog and your new pattern!!! I really like your pattern and would love to win it! This weekend we've taken it pretty easy, which is nice. It's a holiday here today so even better! I spent the weekend enjoying ours trip to the Quilt market :-) Aren't Twitter and Facebook wonderful! This weekend I enjoyed the beautiful weather finally went to David Cheng's Noodle Bar in NYC, it was delish! I had a great weekend with a visit to the Greek Festival. Laundry. Lots and lots of laundry! Great giveaway! This weekend, I assembled Ikea furniture and worked on a llama log cabin quilt - way fun! Lovely! This weekend we celebrated moms birthday with a great party in our garden! And I managed to plant all those plants into our vegetable place! We spent a lot of time this weekend at the t-ball field! Thanks for the giveaway. I have 5 quilts going right now! Thanks for the giveaway! I am a follower. I took a great hike this weekend with my husband and celebrated my neices birthday. i took the kids swimming! I really like this pattern! We just got back from a week at the beach so I'm ready to get back to sewing soon. It was my birthday this weekend so we did pizza, ice cream and a walk to the park. Love your quilts and wish mine were so beautiful. I'm just starting work on a purple quilt for my granddaughter. I hope to have it completed by the time she graduates high school in about 4 years. Ha! This weekend I was visiting a friends sister. Sadly I broke the pedal on her bike...:( But otherwise we had a great time! I drove down to Charlotte on an IKEA shopping spree this weekend! Oh, and I follow you in Google Reader! I'm drooling over the fabrics with gray accents, such as aqua, red, and gray or another combination of gray, yellow, and white. Thanks for the give a way! Love your quilt! I have been trying to find inspiration for my next project and this quilt just might be it. I had a lovely weekend. Visited my brother and sister in law and unexpectatly stayed for a BBQ. Life is good! This is a great design. I currently working on the next Zakka Style sew along project. Ah, I really hope I win, I've been wanting to make this quilt since I first saw it on your blog. Ooh, I love that quilt pattern! I've really been enjoying quilts that feature large pieces of fabric to show off the prints. This weekend I managed to clean the kitchen floor and baste 2 quilts. Now I've got to get them quilted! I love this quilt pattern! As for me, I survived this weekend. That's the most that can be said. And my favorite color combo these days is the entire color spectrum - I just finished two charm swaps, so I've got rainbows on the brain! I am a follower. I love your blog. I always look forward to new posts. They are always so inspiring. I'm celebrating my birthday today and have been loving turquoise and orange together!!! I'm excited about Lotta Jansdotter's Bella coming soon! Love this pattern! I took a longarm quilting class this weekend and am excited to rent time on a machine soon. I spent almost 4 hours helping my husband build our new easy to assemble bbq...that was fun (not). And played our first softball game of the season which we won! My current favored color combo is orange and turquoise. Thanks for the giveaway opportunity. Lately, I've been doing a lot of personal genealogy and I like it so much that I've decided to start up my own little business! i celebrated a dear friend's wedding! I had a fun weekend taking my kids to the park to ride bikes. My husband has been working non-stop lately so it was nice to have a little family time! I love this pattern, would love to have it. Had a nice relaxing weekend- the highlight was a nap (doesn't happen too often) for me. Cute pattern! I'm currently quilting a boy quilt and have come to the realization that most quilting patterns I like are girly. ooh, nice pattern! I've been working on a baby dress for my niece. It seems to be taking forever though, I'm ready to quilt again! Oh I love it! Im enjoying my girl doing my hair just now. Shes dressed up as Aurora and I look like Trixie from Lazy Town! I've been trying to get nursery projects sewn -- this baby waits for no one! This weekend I cleaned, went home to see my mom and we opened her pool. Fav new color combo is Coral Aqua and Navy and I've been up to my ears sewing quilted growth charts for all the new babies in my life. Love that pattern. So simple, clean & classy. Went fishing with hubby this week end, having fish for supper!! Don't publish email address please & thank you. What a great pattern! Spent the weekend cleaning the house, unfortunately, but did manage to eke out a little sewing time. :) Thanks for the chance to win! Last weekend was my daughter's last soccer game and her dance recital. And I had a baby on Tuesday, so we've been busy :) Looking forward to chilling out this week before the end of school activities. Would enjoy a chance to win. I really enjoy your books. The weather has been so nice, I have been planting flowers. I've been working on a tedious new quilt that involves paper piecing to create perfect geometric shapes. One day it will be done. Favourite new colour combo is raspberry, orange and lemon yellow, can't get enough of how summery and fresh it feels! Thanks for the chance to win a copy of your pattern. I went with my mother for a reunion of sorts with 4 of her brothers and a sister. It was hilarious as I listened to 3 conversations going on at a time. I could tell they all had a great time - ages 89 to 70 and fun to be around. This is such a fantastic pattern. I am busy cleaning up my yard, but also working on new pillows! Thanks for the giveaway. I love this pattern! I had a busy weekend of family outings and baby showers. we just had a new baby in the family and this pattern will be perfect for her !! thanks !! hosted a 2 day garage sale and baked a homemade cake-thanks for the giveaway! This weekend I mostly loved on my new little son Nikolai who is 2 weeks old! My favorite new color combo is yellow and grey and I am just about to start a new baby quilt for a close friend. We celebrated my neice's graduation from High School! So much fun with family and friends!!! I'm loving this pattern! I'm currently working on a slew of quilts for Christmas gifts! I love this pattern! I made a jelly roll quilt last weekend. I LOVE this pattern! This weekend, I finally finished up my retro flowers quilt for the quilt-a-long. I'm VERY much looking forward to starting a new quilt (and non-curvy) and this would be perfect!! Your pattern is on my list of patterns to be purchased, so it would be absolutely wonderful to win! Over the weekend, my husband and I celebrated our 6th wedding anniversary. We went to the zoo during the day and stopped on the way home to buy some plants for our garden/flower beds. Then, we went out to dinner in the evening at The Melting Pot. Pretty pattern. I just finished up a bunch of little projects that were on the mending list. Two pairs of pants, two shirts and a dress. It's good to have those off my sewing table. Thank you for the giveaway! And I have been wanting to try this pattern for ages - I have the perfect bundle of Bonnie & Camille just waiting to be made into this! I love this pattern and am excited for a chance to win one! This weekend I spent celebrating my birthday with my family, but the best part was spending a gift card to my local quilt store. Thanks for the giveaway! I have had my eye on this...I'm a beginner quilter and this would be perfectly doable! I love that pattern, and would love a copy! I just learned how to pebble quilt yesterday, and have been quilting little circles for what feels like forever! I've been loving bright rainbow colors paired with grey. I just love this quilt and now a chance to win it! This past weekend, I babysat two of my granddaughters who are 5 and 1. It was fun and I managed to read some of a quilt magazine when they were busy playing. Thanks for the giveaway! I follow you on Google Reader. Thanks for a second chance to win! love that fun pattern! Thanks for the giveaway. i have been sewing more clothes lately but am itching to get quilting again! This fellow yooper would love to win this pattern!! Thank you! I have just the fabric sitting around waiting to be made into this quilt! I;m always quilting bed size quilts...lately I;ve been making a lot of table runners...thank you for this gift. I've been working on a Retro Flower top this weekend. My favorite colors right now seem to be citrus... liking Kona Lemon, Lime, and Tangerine. Thanks for the giveaway! Great job on this pattern. I'm a follower - thanks for the giveaway. I went to the Farmer's Market this weekend and then rested as it was too hot to do much. I'm working on recovering outdoor cushions for a friend. My favorite color combos - today - are anything with grey. Thanks for the giveaway. My husband and I spent the weekend in Duluth. It was the first time I've spent a night away from my daughter. It was a super busy weekend with a birthday party, a going away party, a visit from my MIL, acquiring new chickens, my anniversary, and a campfire. I need all week to recuperate from all the fun I had! I cut up lots of squares for a new quilt this weekend! Loved this pattern when I first saw it -- thanks for the chance to win one. Can't wait to finish piecing my swoon quilt tomorrow! We recently bought a home and it came with a hot tub. We got it serviced this weekend and spent a looooootttttt of time in it! It was fabulous. I spent the weekend hanging out with family at our family trailer over the un-official start to summer in Canada (a long weekend!). it was great and relaxing! Oh, and I'm also a follower! I spent my weekend doing yard work, gardening and cleaning the garage. I love oranges and blues together and also greens and blues. Thanks! I love citron and gray together these days, with a pop of bright orchid purple. PERFECT! This weekend was family, sun, little league & mexican food! I'm moving to the BEACH this weekend, so I can't talk about much else besides packing, breakables, tape, bubble wrap, and boxes. Thanks for the giveaway because I LOVE this pattern! I went to a block party and met some great new people, even a quilter! I've just become a new follower - love your blog so far!! My new favorite color combo is yellow and grey. This weekend, I got half of my garden planted. Yee haw! This weekend spent at the beach with dogs and kiddo...plus sewing in the evening, tons of fun! Thanks for the chance at your giveaway! I love this pattern! I recently finished sewing Emily's Memory Game from the Purl Bee. Love that pattern! This weekend we had great plans involving a trip to the beach, but weather was bad, so just stayed at home being lazy. that pattern is awesome - would love to win it. happy tuesday! Beautiful pattern! I'm making my second quilt right now (baby sized, scrappy) and would love to branch out. My favorite current color combo is turqoise, lime and orange. This weekend we went to a beautiful wedding. I was so happy to give the newlyweds a wonderful quilt that I made for them. My favorite combo of fabric includes any color paired with gray!!! This weekend I went to the beach with my friend and relaxed! I have been sewing black apple dolls for my girl's big birthday party! I spent the weekend baby sitting my 15 month old grandson, James. He is a hoot. He cracks me up. we celebrated my husbands birthday this past weekend. thankS! Worked on a quilt for my grandma. Almost done!